Action from Spalding (blue) v Leek earlier in the season. Tonight’s Cambs Invitation Cup semi-final between Cambridge City and Wisbech Town goes ahead after passing a pitch inspection this afternoon (February 27, 7.45pm kick off). 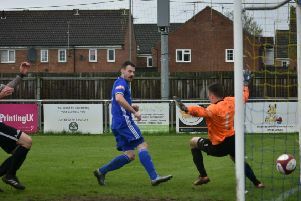 Wisbech, who lost teenage striker Harry Limb to Premier League Burnley last week, warmed up for the big game with a 5-0 thrashing of Cogenhoe in the United Counties Premier Division. Spalding can join Shaw Lane on 65 points at the top of Division One South of the Northern League with a win at Leek Town tomorrow (February 28). Shaw Lane will have six matches in hand though! It’s a tough game for the in-form Tulips as Leek are just outside the play-off places themselves. Stamford AFC have a key game at the bottom of the table at Carlton tomorrow.